It can be hard to look into the mirror and see a smile that you know is less than perfect, especially when that imperfection is caused by one or more missing teeth. If you’ve gotten serious about correcting your smile and have been speaking to your dentist about it it’s likely that dental implants have already been discussed. While the technology for implants has been around for thousands of years, it’s only recently that technology has made it possible to get long-lasting implants that are almost impossible to distinguish from the real thing. What Can Dental Implants Do To Restore My Natural Smile? This is likely the most important question on your mind at the moment, what can be done to fix my smile and is it going to be worth it? The answer to this question is going to be different for every patient and necessitates a conversation with your dentist. By and large, however, dental implants are the most effective way to improve an ailing smile caused by missing teeth. Most patients who have missing teeth can benefit from dental implants, but only your dentist knows for sure. I’ve heard that Dental Implants are Expensive? Dental implants have a non-trivial cost associated with them, and they aren’t covered by most insurance companies due to this. Only your policyholder will know for certain whether you can qualify for dental implants under your plan. Dental implants often run in excess of $1000 or more a tooth, but it’s important to discuss your case with your dentist to get an exact quote. Are Dental Implants Difficult To Care For? Dental implants are no more difficult to care for than your natural teeth, especially if they are the ‘permanent’ variety. Permanent implants refer to those styles that only come out twice a year during your routine visits for cleaning. For all types of implants regular brushing, flossing, and use of mouthwash are recommended to help keep them looking their best. You will have to take some care in selecting the equipment you use to take care of your teeth, with soft-bristled brushes being recommended along with anti-microbial mouthwash. 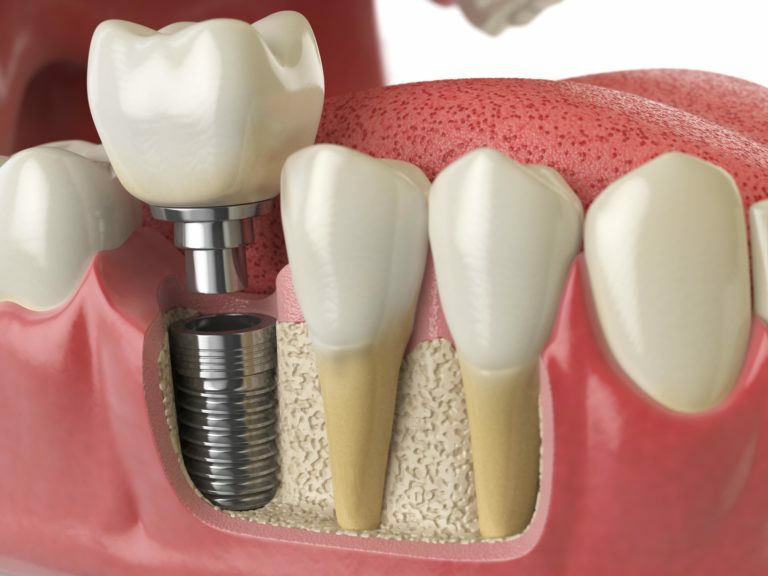 Removable implants permit the wearer to take them out twice a year and clean under and around them, something typically unnecessary with permanent implants outside of the twice-yearly maintenance. If you’ve reached a point in your oral health where it’s time to consider dental implants pick up the phone and contact Dr. Amanda Rae Kronquist at the Sunset Dental Group in Santa Ana, CA. Alongside her team and her partner Dr. Jerry Kronquist she’s been providing exceptional orthodontic and general dental care for patients for years. Don’t let another day go by with a smile that makes you self-conscious, call today and get a consultation for their cosmetic dentistry services and you could be on the road back to a smile you feel good about showing off. What Does It Mean For A Tooth To Be Impacted?